one of the tendons that laterally and medially bound the depression in the popliteal fossa (posterior region of the knee). The inner and outer hamstrings. inner h's the tendons of the gracilis, sartorius, and two other muscles of the lower limb (see anatomic Table of Muscles in the Appendices). outer hamstring the tendon of the biceps muscle of the thigh (see anatomic Table of Muscles in the Appendices). /ham·string/ (ham´string) one of the tendons bounding the popliteal space laterally and medially. 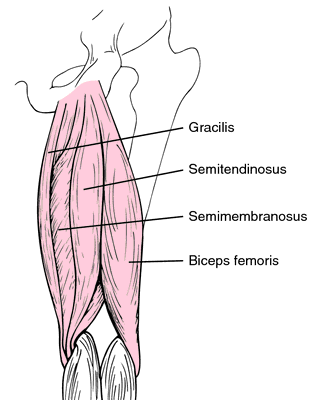 inner hamstring the tendons of gracilis, sartorius, and two other muscles of the leg. outer hamstring tendon of biceps flexor femoris. 1. the two tendons behind the knee or stifle and their associated muscles (biceps femoris, semitendinosus and semimembranosus). 2. the Achilles tendon. A hamstrung animal has this tendon ruptured. When the specific area of tightness of hamstring muscle is located, the further treatment is limited to this target area. Total 80 individuals were screened for tightness of hamstring. While surgery is not always required with hamstring injuries, Michael has substantial damage to a key part of the hamstring tendon. All the participants showed signs of hamstring healing with many having early scar tissue formation at the time of return-to-sport. This review will use currently available evidence to evaluate the effects of static stretching as prevention of hamstring injuries in football codes. That support of Elliott's research, titled Interventions for Preventing Hamstring Injuries has now been published by the influential Cochrane Collaboration in the Cochrane Library - the world leader in evidence-based healthcare. In other words, use the hamstring flexor machines at the gym, but add Pilates or Gyrotonics for dynamics of stretch, strength, and movement for a well-rounded regimen. In some cases, even casual activities, such as walking after sitting on an airplane or in a car for a long trip, or walking down stairs carrying a heavy load, can cause a strained hamstring. Methods: Hamstring tightness was measured using the active knee extension test (AKET) in 240 apparently healthy male and female subjects, aged 5-59 years. Craig was again in the office several months later after another hamstring strain during a long run. Running-specific strength training--it makes (postural) sense! Cardiff City winger Parry, who won his first cap against Scotland, is recovering from a hamstring injury which has kept him out of the last two Nationwide League matches.